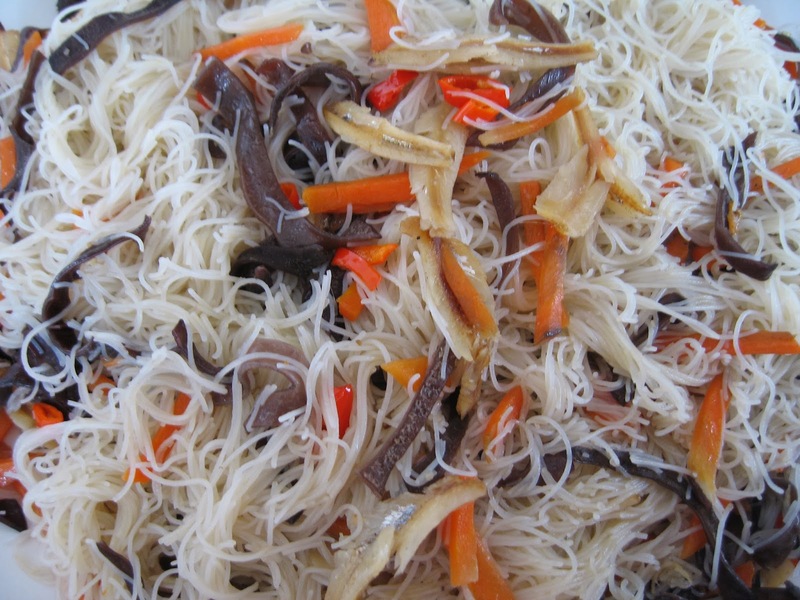 It is believed that black fungus clears blocked arteries. There are many articles expounding the goodness of this fungus which is reported to be able to diffuse cholesterol the natural way. However, such articles usually advised us to boil the fungus for several hours, after which the fungus is discarded and we are to drink the soup only. There is another belief that black fungus helps build the cartilage surrounding the joints of bones, like the knee caps. I believe this because it works favourably for me! Each time I consumed black fungus, my aching knees usually felt better! But then, one or two pieces cannot work wonders! You have to eat more and eat them regularly before any effect can be felt. 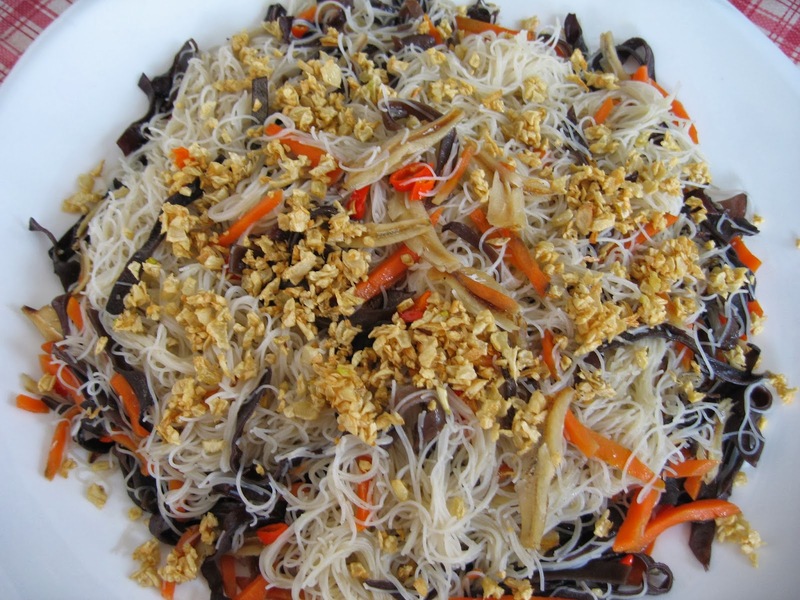 With this piece of advice in mind, I was purchasing a bag of black fungus from my regular provision shop when the elderly proprietress told me that black fungus can be used to fry vermicelli and that it is very crunchy and tasty! She told me to cut them into thin strips and fry them with lots of garlic. She did not give me an exact recipe. Thus I had to use my imagination to try it out this way. 1. Heat wok and fry the chopped garlic until light brown and fragrant. Remove the garlic crisps. 2. In the remaining oil, add anchovies, black fungus and carrot. Stir-fry for 2 minutes over high heat. 3. Add water, salt and chicken stock granules. 4. When it comes to a boil, add in the soaked vermicelli. 5. Use a pair of chopsticks to stir the vermicelli and mix well. 6. 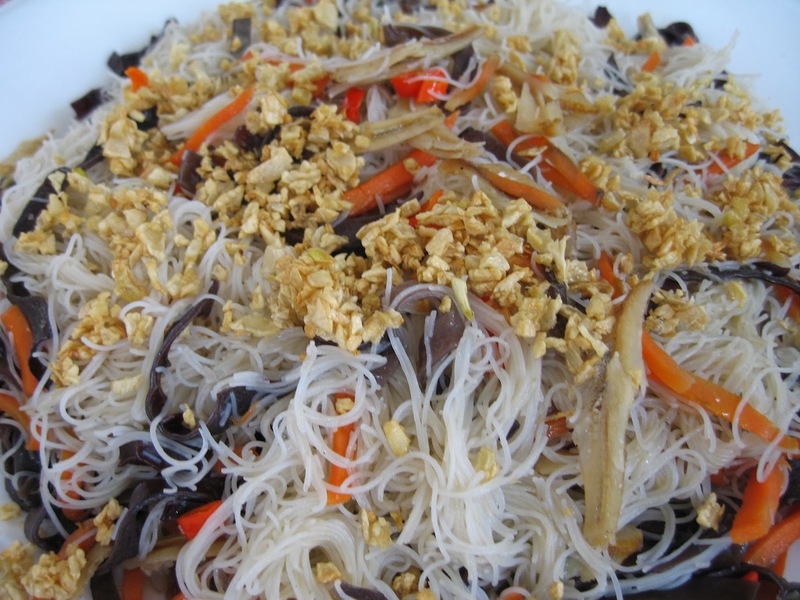 Continue cooking and stirring until the vermicelli nearly dries up. 7. Switch off flame and dish up. 8. Spread the garlic crisps on top of the fried vermicelli. If you want a light lunch this is very suitable.